Synopsis: Incarceron is a prison so vast that it contains not only cells, but also metal forests, dilapidated cities, and vast wilderness. Finn, a seventeen-year-old prisoner, has no memory of his childhood and is sure that he came from Outside Incarceron. Very few prisoners believe that there is an Outside, however, which makes escape seems impossible. I absolutely LOVED this book. I stayed up way too late last night reading it because I just couldn't put it down. I just had to know what would happen to Finn and Claudia. 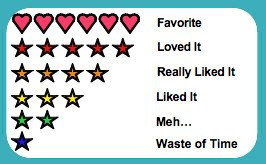 I need to create a special rating for books that go beyond a 5, but I haven't done it because it hasn't happened too often. I haven't read too much steampunk, but I think it is something I'll have to investigate more when looking to read a fantasy book. Catherine Fisher grabbed me right off the bat by jumping right into the story. It was one of those experiences where you are a bit confused, but just go along with it to see where the story takes you. This worked really well with the rest of the book, especially when I think back to Finn's character. Finn pretty much went through his life in Incarceron just going along with whatever came at him, until he finds a key and decides it is time to break free from the prison. Of course how can he be sure there is even an outside? While Finn and his companions are trying to find a way through the maze of Incarceron, Claudia is trying to learn about Incarceron's secrets. Fisher is able to weave the characters' quests together in a way that is not jarring, but adds to the pace of the book. This narrating technique was really interesting because the characters fates are intertwined just like their stories in the book. If you haven't noticed, this book really has everything. It has a fantastic plot, memorable characters, twists that will make your jaw drop, and good writing. The post-apocalyptical society was really interesting to me, especially with the creation of a jail that can think and act on it's own. I really wish I could get hold of the second book, because I can't wait to see what is in store for the characters. Not all the characters were likable, but they all were interesting and unique. I think that Keiro and the Warden my have been my favorite characters while I am reflecting on the book; they were just constantly surprising me. I honestly could talk about this book forever, which makes me think it would be a great bookclub book for teens, tweens, or even adults. Here is the first chapter of the book from Catherine Fisher's website. She does have a list of other books, but not all of them are printed in the US as far as I can tell. I did get this book free from the publisher because it got sent to the store I work at. The best part of that story is that I had actually borrowed the book, but my manager saw how excited I was and gave me the copy the publisher sent. I came soo close to buying the book that day too lol. Definitely glad I waited on that. Review: of "The Iron King"
Contest Winner of "The Secret Year"